Engine water pumps are powered by petrol or diesel. Engine driven pumps are designed to be used out of the water and must not be used inside buildings or partially enclosed areas. Pump end options are either centrifugal or diaphragm. Both require inlet and outlet pipe. A centrifugal engine water pump requires priming initially to self-prime and should not run without water. A diaphragm engine driven water pump does not need priming and it can run dry. 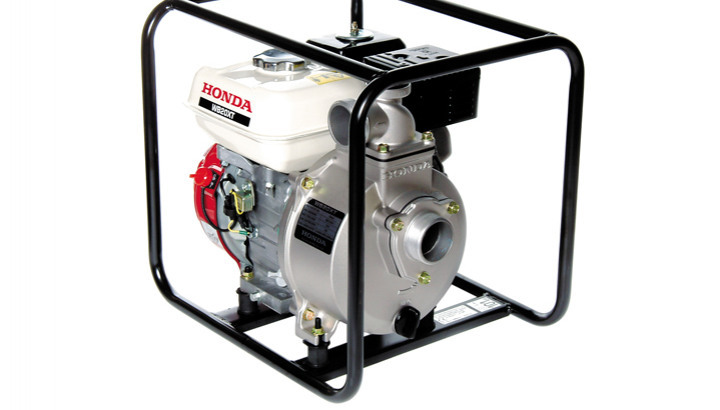 The WB Water Pumps in Carry Frame are self-priming pumps powered by 4 stroke Honda engines. Compact, portable, easy to start up and operate they can pump clean dirty water. Robust design, with good flows and pressure, they are suitable for irrigation, site use and general transfer. WB and TE2 Engine pump in carry frame models also feature oil alerts for engine misuse protection.